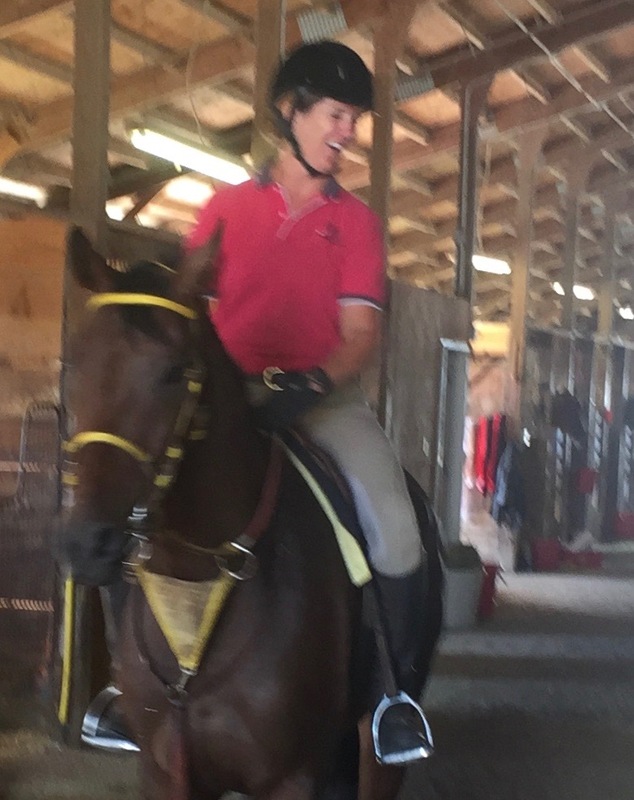 I’d heard about the Retired Racehorse Project Thoroughbred Makeover (RRPTM) a few times. I had a vague notion about some event that happens in fall at the Kentucky Horse Park where people competed with their off track thoroughbreds. I found myself thinking that was very cool. And I heard an unmistakable distant beckoning. Then my friend was telling me about it and how much fun it is and how many people she met when she competed there last year and did very well in the field hunter division. I thought that was really cool too, and the beckoning grew a bit louder and significantly closer. Well, then I got a new farrier in the barn. Don’t get me wrong, my usual farrier is great and I still use him, but a new client insisted on having this new farrier do her horse while he was in training with me. Not a big deal to me, so I get the new guy in, and have a cup of tea and chat with him as he works. And the beckoning was in the room and the approximate size of an elephant. So I called the guy and went down to the track to look at the horse. I get past the guard shack and find the right barn, and stall, and the trainer, and owner and the horse. At this point, I’m feeling accomplished just having done that. They show me the horse, “Howdy” and he is indeed about 17h. He’s also a ridiculous pocket pony, and the owner comments that the exercise riders said that they should have been paying him to ride Howdy because he was so easy to ride. I thought that might have been laying it on a little thick, but I went with it. I happened to be in breeches so they assumed I was going to ride him – at the track, down the shed row and in the warm up area on the way to the track. I’m pretty sure this is against track regulations, but I play mum because, well, I’d like to ride the horse. So, they put on the mere suggestion of a saddle that is an exercise saddle, lengthen the stirrups as long as they go, and I hop in the tack. It was ridiculous fun. I had a grin plastered on my face the whole time. He walked flat-footed around the shed row, past dogs and radios blaring. Wow. Then we went out in the warm up area, which is on the way to the track. I did some trotting here, and he was tight in his back and high-headed, and relatively short-strided for what you would have thought from his conformation. I chalked most of that up to general tension. Then we cantered, and whaddya know, he had an easy two leads. I know a lot of horses, track or not, who strongly prefer one lead over the other. I trotted a little more, then headed in. He jigged his silly self back to the shed row, which was frankly, at times, not fun, but not terrifying either. I just happen to really object to jigging because it develops all the wrong muscles. However, Howdy and I had no mutual tools to communicate with so I grinned and sat there like an idiot. So I got back to the barn and rode him in to his stall (they told me to! It freaked me out, but apparently it is common practice) got off and offered that he’s a nice horse, and thanked them for meeting with me and showing him to me. They let slip that he hasn’t been out of his stall in 5 days due to track conditions. I was glad they did not tell me that before I got on because I would have been all “I’ll come back another day” or “Can I lunge him somewhere?” Ignorance is bliss. We chatted while they put him on the hot walker and I snap a few pictures. This one, in particular, strikes me, and I when I looked at it, I pretty much knew I needed to have this horse in my barn. Why? Partially because his mostly calm personality shows through, and partially because he looks like Eddie in the picture. 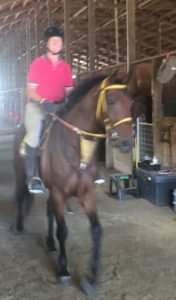 Eddie (Best Etiquette) is my event horse/fox hunter/good citizen, classic thoroughbred, 18 year old gelding. I look at Howdy and I see what he can be. He won’t be Eddie, he’ll be different, I know this, and I see that he can be someone pretty great in his own Howdy way. So we negotiate a price and we agree that I will pick him up in a few months when I will have room in my barn. Some weeks later, my husband Jay and I went out to look at him at the farm where he was being let down. (And ok, part of this was to get husband buy-in). When we got there, Howdy came right to the gate and gave us this face (below). That was a good start for husband buy-in. Smart man, Howdy. Fast forward to tomorrow and we are at that few months later when I will pick him up. 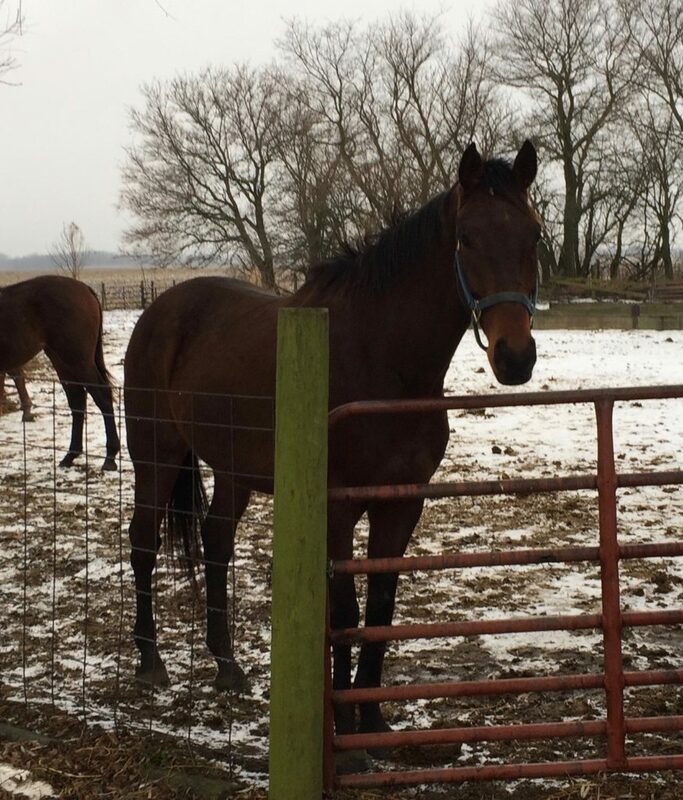 The day after tomorrow Howdy has an appointment for a pre-purchase exam at ISU. Whee! I made these cookies to help him decide to get on our trailer tomorrow afternoon. I may be a little excited. Hee hee. We’ll also have cookies for all the horses when he gets home to Field Day. Nothing makes a better first impression than showing up with food. I hope the class likes the new kid.